Macro Plastics relies on SOLIDWORKS Simulation Premium analysis software to optimize designs for its large agricultural bins, cutting material costs while maintaining strength. Macro Plastics, Inc., is the leading manufacturer of large agricultural bins in North America. The company’s products, which come in 70 different models, are a staple among fruit growers for picking, transporting, and bringing everything from apples and oranges to grapes and cherries to market. 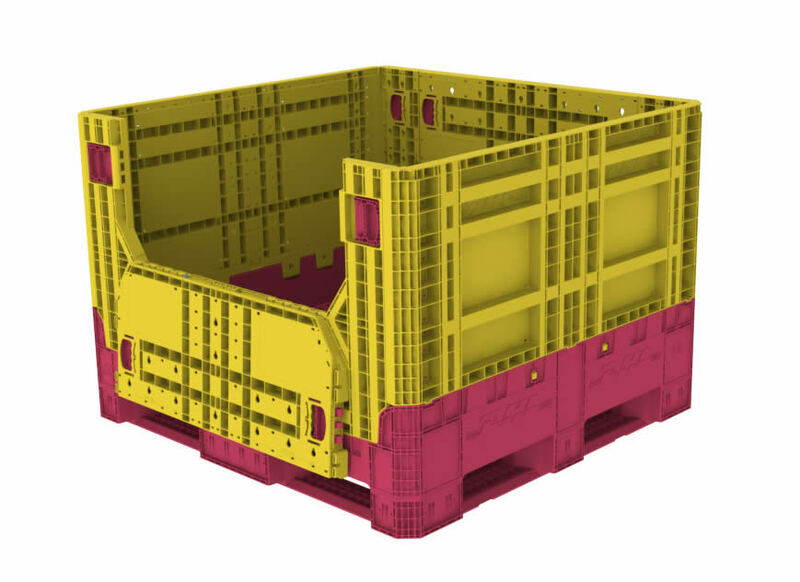 Bins from Macro Plastics are made from high-density polyethylene and polypropylene plastics, and are preferred over traditional wooden crates because they offer greater protection, delivering higher quality fruit, and are washable, reusable, and recyclable. When your product is made entirely out of plastic, which continues to rise in cost, and you operate some of the biggest high-pressure plastic injection-molding machines in the world, optimizing designs for material usage is an important goal. Macro Plastics stackable bins must withstand significant loads, yet every ounce of material saved will positively affect the company’s bottom line. Macro Plastics benefits from using SOLIDWORKS® Standard, SOLIDWORKS Professional, and SOLIDWORKS Premium design software in the development of its agricultural bin design. Turner says that design tools such as the rib command and draft and wall thickness analysis are very helpful, but that SOLIDWORKS Simulation Premium analysis software plays the most dramatic role in helping the company produce agricultural bins using the minimal amount of material necessary to do the job. 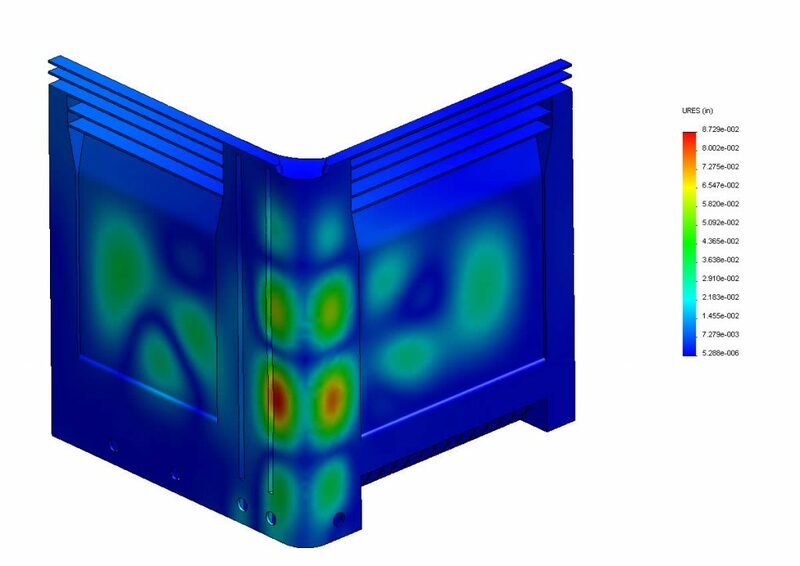 Macro Plastics uses SOLIDWORKS Simulation Premium software as a design tool to optimize designs rather than in the traditional manner for design validation. “I haven’t done FEA for validation in at least five years,” Turner says. “For me, SolidWorks Simulation is a development tool. I know how the design is going to perform before I need to validate it because simulation is an integral part of the design process. Macro Plastics can use the optimal amount of plastic to support each product’s specific loading conditions, saving money while ensuring performance. Expand the development of plastic container products while increasing efficiency, improving quality, and controlling costs. Implement SOLIDWORKS Standard, SOLIDWORKS Professional, SOLIDWORKS Premium design, and SOLIDWORKS Simulation Premium analysis software solutions. "With SOLIDWORKS Simulation, I can identify and resolve potential issues during design, so that when we mold those initial pieces, they are right the first time. It’s an incredible tool that has let us save 30 to 60 percent in capital costs in the development of new products."